Theater producer and political activist TOM D’ANGORA discusses the 2016 Presidential campaign for which he served as LGBTQ Ambassador for Secretary Hillary Clinton. Tom also talks about his two current hit productions of The Marvelous Wonderettes and Newsical The Musical. 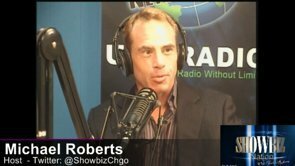 SHOWBIZ NATION With MICHAEL ROBERTS/SEASON 4/ INTERVIEW WITH TOM D’ANGORA from SHOWBIZ NATION LIVE! on Vimeo. Tom D’Angora is a multi award winning Producer/Director who currently produces two of the longest running musicals in New York Theater history. Tom has been nominated for three Drama Desk Awards and is the winner of The Off -Broadway Alliance Award amongst others. Tom first made waves in NYC as a singer and comedian, winning the Backstage Bistro Award for Best Musical Comedy for his one man extravaganza, Divas I’ve Done. The show played for 3 years with sold out runs at Upstairs at Studio 54, in LA, Boston, and Provincetown. He was honored as one of Playbill.com’s “Vocal Heros of 2003” and performed at Joe’s Pub in their “Leading Men” concert along side Broadway’s biggest leading men at the time! In 2005 D’Angora was the youngest lead producer in NY to be at the helm of a major commercial production, A BROADWAY DIVA CHRISTMAS. It was a star studded holiday concert featuring some of Broadway’s biggest leading ladies at the time. Tom has served as producer/director to countless plays, films, albums, concerts, special events, and television shows. Tom gained notoriety for his innovative use of celebrities in his productions and over the years has been blessed to work with some of the most notable names in show business. Tom D’Angora currently serves as lead producer and show-runner for the mega hit NEWSICAL THE MUSICAL and THE MARVELOUS WONDERETTES.